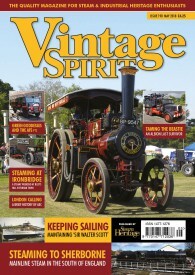 ‘Vintage Spirt’ is a monthly magazine for steam and industrial heritage enthusiasts. This specialist publication covers event reports and news from the preservation world, as well as fascinating features on restoration projects, manufacturers, museums. In May 2018, Vintage Spirt carried an article written by a regular contributor, author and photographic and heritage historian, Professor John Hannavy. ‘Water, Water, Everywhere’ explores the history of drinking water and and was written following a visit to the Waterworks Museum - Hereford. You can read the article by clicking here. 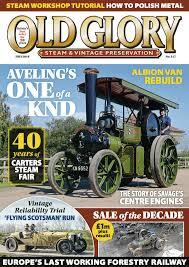 'Old Glory’ is a magazine for steam and vintage machinery enthusiasts which, amongst other things, offers a nostalgic look back at steam’s golden age and uses features and archive material to provide inspiration for new restoration projects. In May 2016, Old Glory featured an article about the Waterworks Museum and our celebration in October 2015 of the 160th anniversary of our Worth Mackenzie Triple Expansion Beam Engine, which is the oldest steam engine of its kind still operating in the UK. You can read this article by clicking here. In spring 2018, the Worth Mackenzie Triple Expansion Steam Engine was confirmed as the 116th recipient an Engineering Heritage Award from the Institute of Mechanical Engineers (IMechE). This award, which, we believe, is the highest accolade an industrial heritage museum can receive, was dedicated at a presentation at the Museum on 7 May 2018. 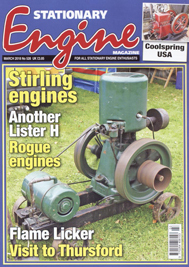 “In March 2018, Stationary Engine carried an article about the very popular Stirling Engine Rally held at the Waterworks Museum every October. You can read the article by clicking here. 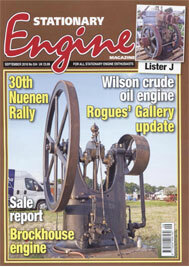 The next Stirling Engine Rally will be held on 14 October 2018." In September and October 2018 Stationary Engine carried a two-part article about the Wilson Engine / Massington Lineshaft Project, which you can read here: part 1 / part 2. Subsequently, this project was announced winner of the West Midlands Museum Development Volunteers Project Award for 2018, which is a tremendous accolade for the efforts of the Museum’s volunteers as told in the Stationary Engine article. You can read the Museum’s press release for this award by clicking here.